While rummaging through a folder of old recipes, I found this bread recipe I saved from a 1973 yeast packet. 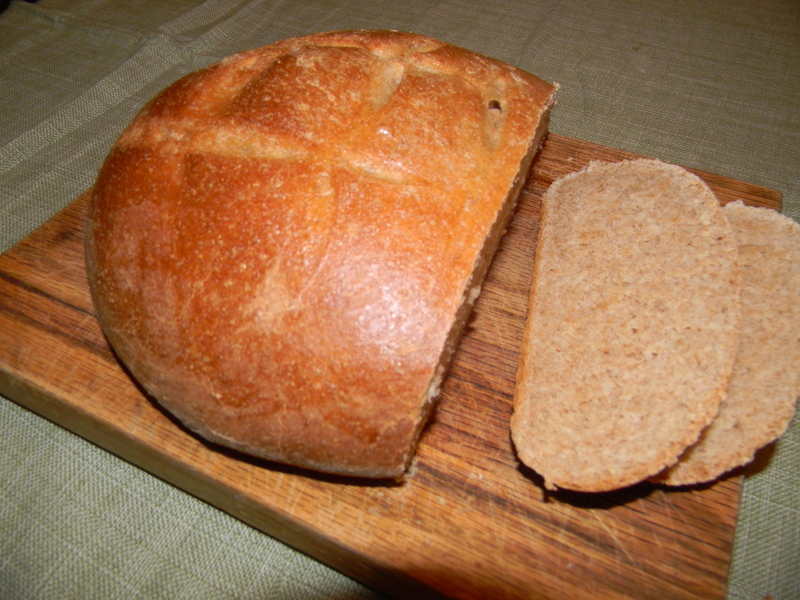 The loaves can be shaped into two traditional rectangular loaves and baked in loaf pans or shaped into round loaves. See suggestions for crust variations below the recipe. 2. In a large mixer bowl, combine 1 cup all-purpose flour, whole wheat flour, yeast and salt. ; mix well. 2. In saucepan heat milk, water, honey and shortening until warm.The shortening does not need to melt. Add to flour mixture. Add egg. 3. Blend at low speed until moistened; beat 3 minutes at medium speed. By hand, gradually stir in remaining all-purpose flour to make a firm dough. 4. Knead on a floured surface until smooth and elastic, about 5 minutes. 5. Please in a greased bowl, turning to grease top. Cover and let rise in warm place until light and doubled, about 1 hour. 6. Punch down dough and divide into 2 parts. Shape into two rectangular loaves and place in greased loaf pans or shape into two round loaves on a greased cookie sheet. 7. Cover and let rise in warm place until light and doubled, about 30 minutes. 8. Bake at 375 for 35 minutes until golden brown. Remove from pans and cool. Crisp,Shiny Crust:brush loaves with a mixture of 1 egg and 1 tablespoon water just before baking.may be sprinkled with poppy or sesame seed. Delicatessen Bread Crust: remove loaves from oven 5 minutes before done; brush with mixture of 1/2 teaspoon cornstarch and 1/4 cup water that has been heated to boiling. Return loaves to oven to finish baking. Cinnamon/Sugar Crust: brush loaves with 2 tablespoons melted butter or margarine; sprinkle with mixture of 2 tablespoons sugar and 1/2 teaspoon cinnamon. Slightly Crisp, Shiny, Sweet Crust: brush loaves with a mixture of 1 tablespoon each sugar and water, after baking.